This week we will take a closer look at the much talked about 'burger tweet' that reached 8.5 million views and got covered by many large media companies. This might seem like a simple thing, but the patterns we saw when all of this happened can tell us a lot about the state of media. In this first article, we are analyzing the tweet itself, and we provide you with a lot of behind the scenes insights. Why did the tweet work the way it did, how did people respond to it, and what kind of real-world effect, as well as KPIs, did it generate? In this second article, we are going to look outside the tweet itself, and instead talk about how the media reacted to it, and how it was covered. We are going to talk about the focus of almost every journalist, and how it ended up serving as a distraction in the ongoing US presidential debate. These two articles combined are 50 pages long (with a lot of pictures/screenshots), so there is a lot to see here. "It makes me sad that attention is such a commodity now that websites will actively try to distract you inside their own articles. Just let me get through 1000 words that you display for my supposed benefit without shoving blocks of links to other articles in the middle." This is something we see all the time in the newspapers. Some newspapers fill out articles with so many links that for every few paragraphs of text, there is a link encouraging people to see something else. We all know why this is happening. It's done because the newspapers are optimizing for ad views. But think about the trend here. What we are seeing today is that advertising is getting more and more problematic, while subscriptions is getting ever more important. But when your page strategy is to distract people with links to get them to click as much as possible on random things, you are also distracting people from actually reading and truly taking in the articles. The result is that, in terms of creating a loyal subscriber-based audience, you are basically shooting yourself in the foot. It also goes against all the trends we see on other platforms. For instance, on YouTube, we see how they have long switched from views (clicks) to 'watched time' as a measure of success. So, YouTube knows that it's more valuable to focus on getting people to watch each video for as long as possible, rather than trying to distract people with other things to see early on. So my advice to you is to think hard about this. What is it that you want your readers to do? And is that behavior aligned with where the future trends are leading you? 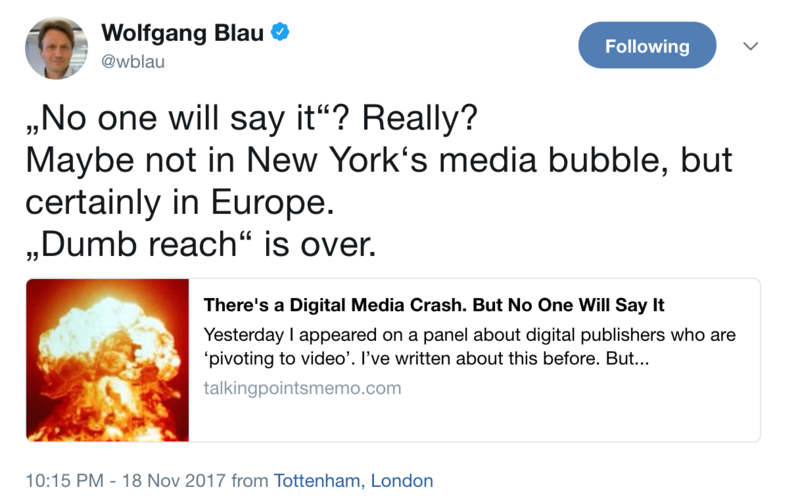 There's a Digital Media Crash ... and we know it. Over the past week, there has been a lot of talk about how advertising focused sites like venture capital funded sites like BuzzFeed, VICE and VOX will miss their revenue targets for 2017, and what that means for the future of media. As Josh Marshall put it: "There's a Digital Media Crash. But No One Will Say It". First of all, this is something everyone outside the US (and Silicon Valley) already knows about and is also already talking about. In fact, most of the publishers outside the US is already taking steps to find another path. "No one will say it? Really? Maybe not in New York's media bubble, but certainly in Europe. Dumb reach is over." I hear this all the time. Every publisher I have worked with in the past year is fully aware of this. And this is especially true in Europe, where country barriers are dividing up the markets into much smaller chunks where you can't create the necessary scale even if you tried. The only ones who don't seem to get this (and aren't talking about it) are the venture capitalists in Silicon Valley and New York. "Yes Vice and Buzzfeed may have missed targets BUT both are past the stage of escape velocity & have a long future. And doing important journalistic work in between their main body of work." So, I'm not worried about these sites, even if it means everyone else has to rethink their future. Like always, the key is to find a model that works just for you.